Aikatsu Stars! – 006 | Mezashite! First drama episode! Just reminiscent enough of the first Aikatsu one (you know, with Shion and the Naughty Detectives) without actually repeating anything. Do you know what a “swot” is? Neither did I. The headbands they’re all wearing say “Pass”. Also did I not just note what Koshien was like a week or two ago? I can’t find where I said it, but I definitely did. Also, Ako. Oh, and the word they use/define is “gariben”. You could figure that out from the images and context though. And where was “swot” used? Did I miss something? It was an option for studyholic. It was kind of hard to watch first few episodeseven if they are as good as old Aikatsu was. The thing is that all the time you felt that something is lacking there. Something that the new girls couldn’t fill. This episode for the first time managed to get the better of that feeling. Seems I’m getting to know and like those girls more with every episode. Laura (Rola) is lovely, Yume is great as protagonist and Ako is cute. Not yet sold on Koharu but it’s getting better. 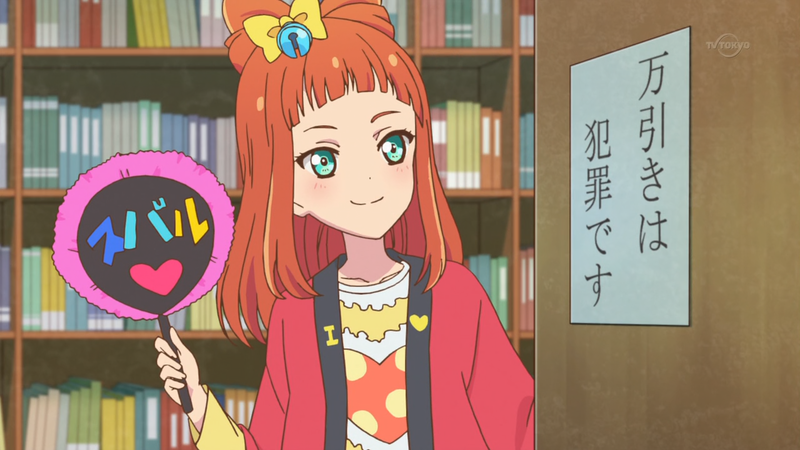 Thanks for the fun you are giving us translating aikatsu. Well, Ako’s tsunderism was facepalm worth. She is cute though. Aikatsu Stars is so great that I started being impatient and watching the raw than re-watching it subbed later. It’s something haven’t done since Ichigo was replaced for Akari on the first series, I’m really hyped for this. What a cheetah Ako is, when Yume-Subaru is going on.